Needle Felting Love and Class! 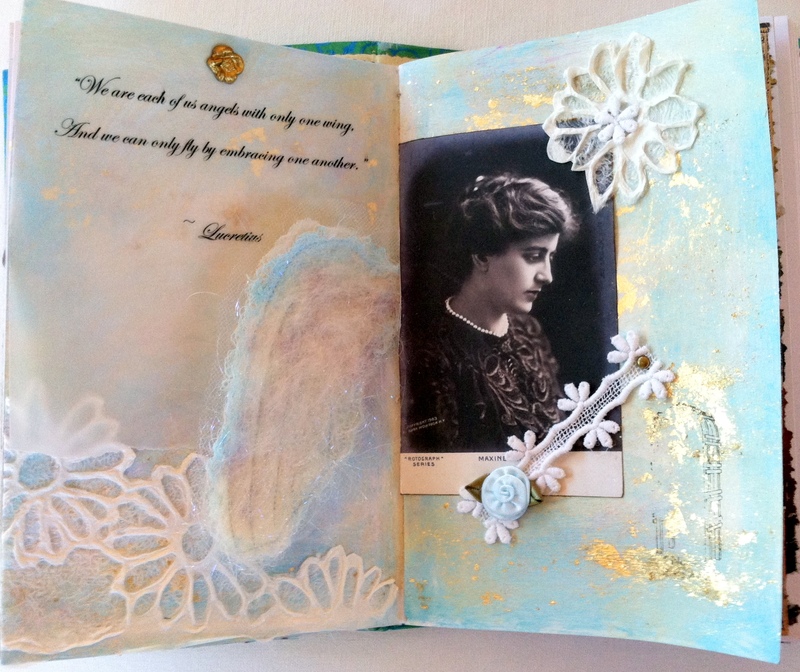 I am working on two altered books for friends with similar themes. I found some old photograph postcards of an actress from the late 1800’s in my stash and decided to use her pensive yet serene photo. 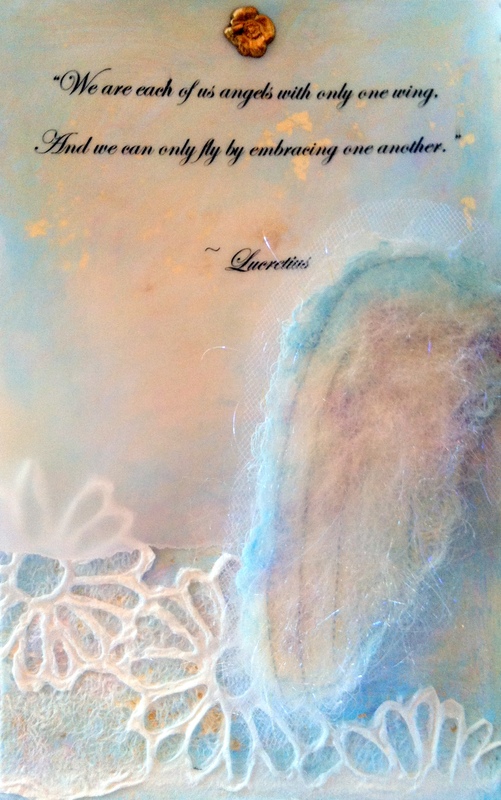 Now to carry out my idea I needed an angel wing… I love needle felting and am always trying to find new ways to use different techniques with it in my artwork. Why not try to felt a wing? Guess what? It was easy! And so is needle felting. I will be teaching a needle felting class at Artistic Artifacts next month. If you live in Northern VA come join me and lets have some needle felting fun together and create something beautiful! 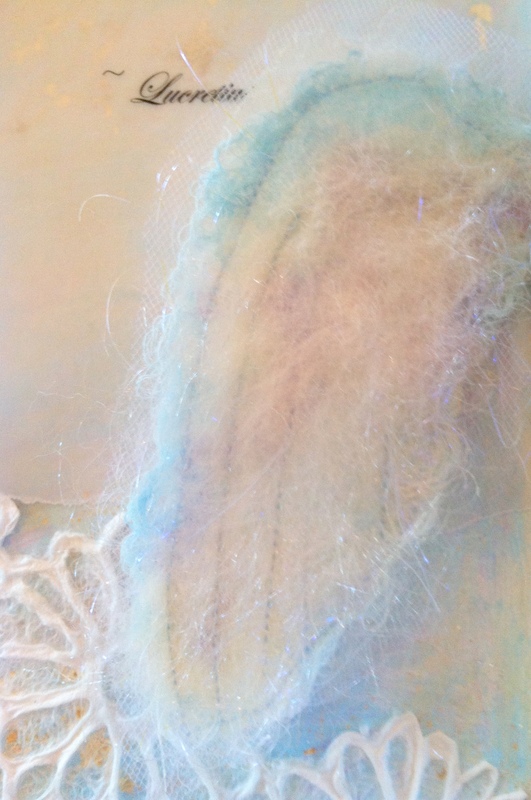 To create the needle felted wing I cut a wing shape out of thin fabric and needle felted layers of dyed cheesecloth, wool roving and Angelina fibers until I was pleased with the color, texture and thickness. Then I cut a slightly larger wing shape out of tulle and placed it behind the wing. Finally I machine stitched the outline as well as a few random lines from the wing tip upwards to simulate feathers and voilà, a wing! So come join me for a class next month and learn how fun and easy needle felting can be. Hope to see you there!